Description: These three, together with R2-D2, were captured and transported by the Jawas in the sandcrawler across the Tatooine Desert. R5-D4 was originally purchased by Luke. 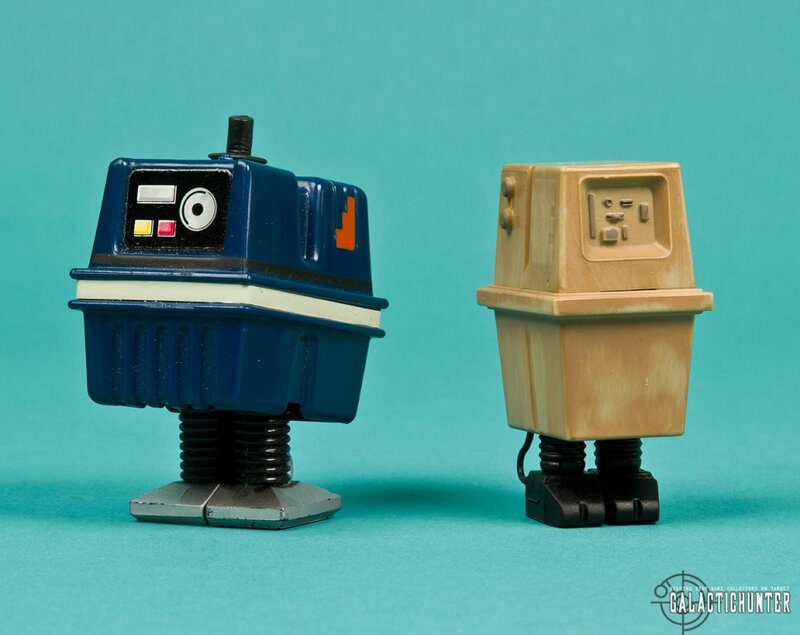 The power droid was first seen in the sand crawler dungeon together with a gleaming silver Death Star Droid. 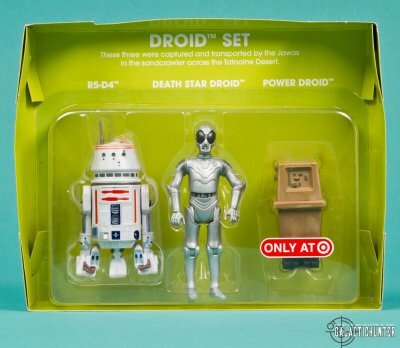 I've always been enamored by these Target sets for their nostalgic value and the fact that I probably would never find nor even dream to afford the originals. Yet, even with modern versions of these figures represented in the packaging, Kenner's classic design perseveres and shines. The earlier releases sold well enough, though perhaps not as well as they could have since the figures included were re-issued. 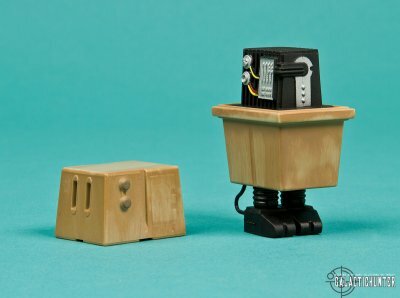 Hasbro brilliantly shifts strategy and offers new figures with these latest multipacks, and for the Droid Set, it's an all new Power Droid…GONK! 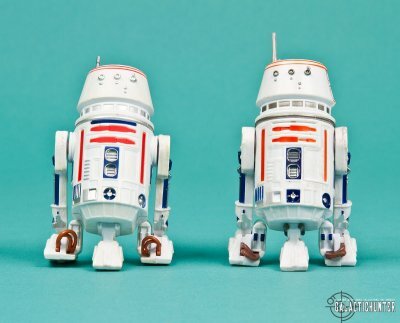 R5-D4: It would have been easy to assume that Hasbro would simply re-pack the Vintage Collection R5-D4 (which was based on a 2009 B.A.D. 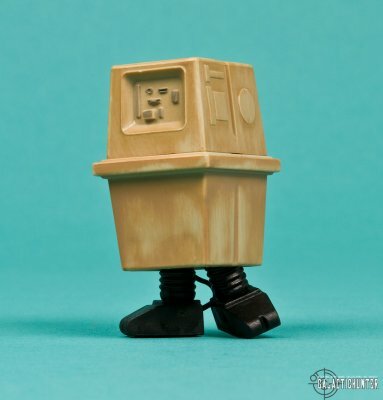 mold) like they did with TVC Bespin Luke for the Bespin Alliance set from 2010. Instead, they re-release what is arguably the better version of Mr. Bad Motivator, and that's the 2006 Saga Collection version with clicking head and "pop up" motivator. 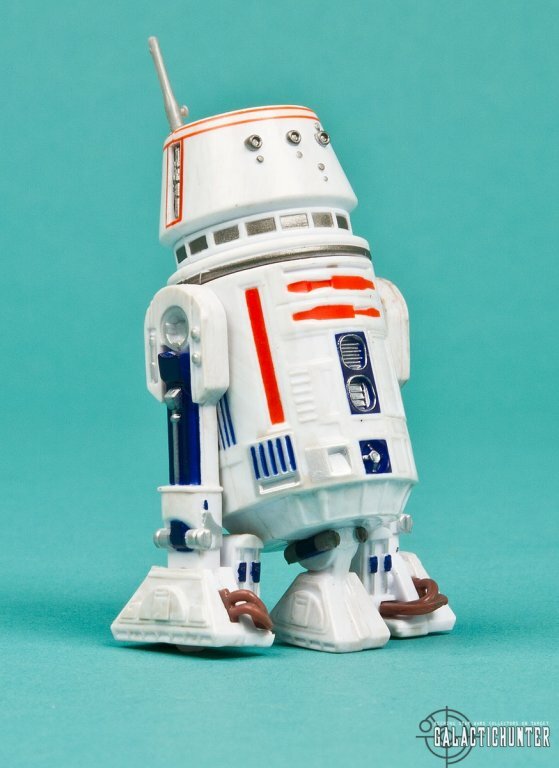 That R5 also re-uses the VOTC R2-D2 from 2004, but with front panel glued shut. Death Star Droid: While not technically a "Death Star" Droid, this RA-7 protocol droid was last seen in several parts as a Build-A-Droid figure from 2008. 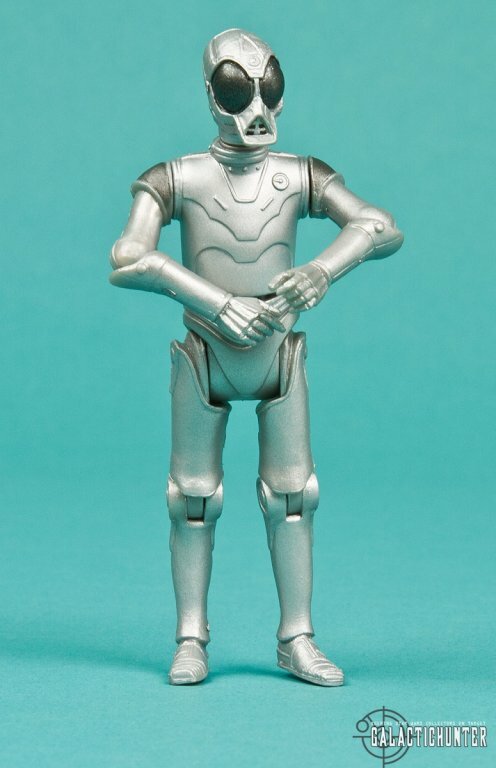 For this particular set, the RA-7 is supposed to be the unit inside the sandcrawler from Episode IV, though this figure is too matte silver and clean for authenticity's sake. 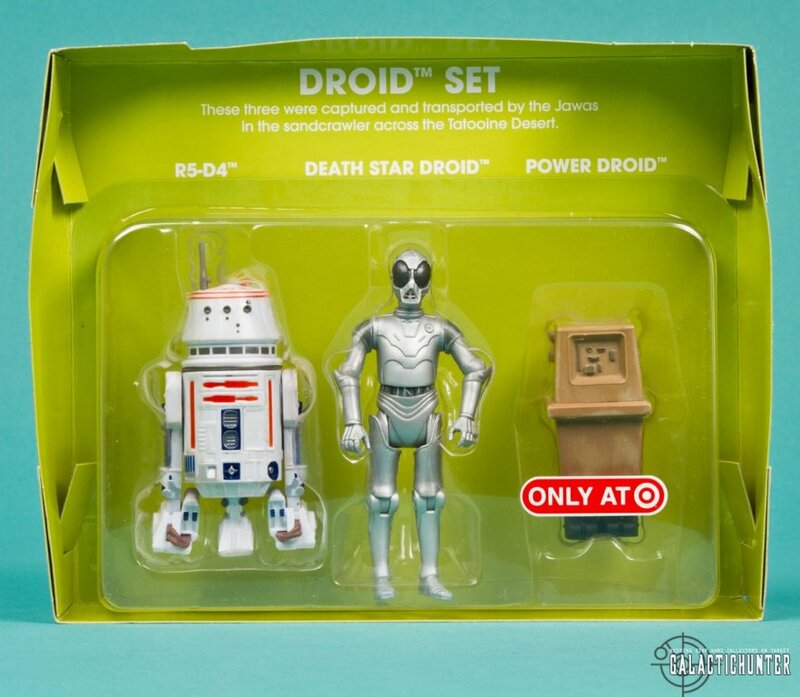 But keeping the "Death Star Droid" moniker to stay true to the original packaging is good and fine. Like an old building that's designated a historical landmark, you shouldn't mess with history. Power Droid: He's not wonderfully blue and righteously wonky like the original Kenner figure, which is one of my favorite droid figures from the vintage line, but this Power Droid is all new with a detachable top panel to reveal his mechanical juice generating innards and adding immense want and desirability in the process. He also comes with ball jointed legs and feet so you can pose him to do the "Party Rock" dance. The mold is simple and clean on the outside but with the motor inside having various sculpted circuitry and parts as well as detailed paint ops with silver accents and colored wires . The top panel pops in and out easily and stays in place and includes good weathering/rust detail. PACKAGING: Sublime. 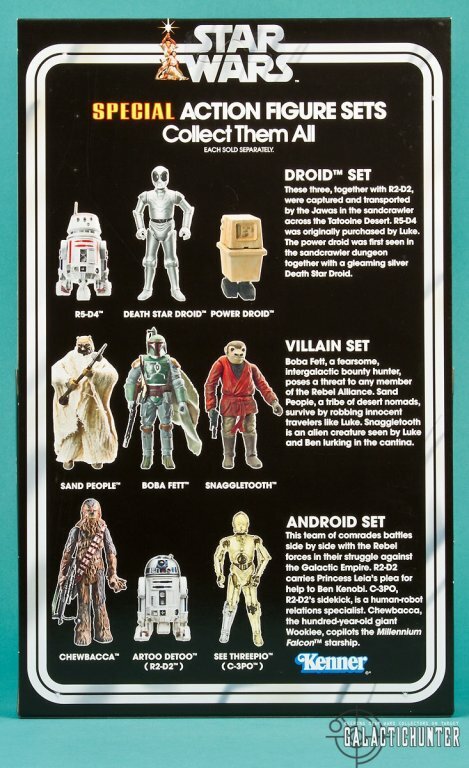 Hasbro faithfully recreates the classic Kenner packaging and character line up of one of the more rare and sought after assortments from that era right down to the green background and description. 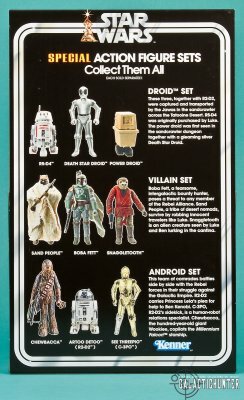 The back of the box also includes the Android Set with Chewbacca, R2-D2, and C-3PO that was the more harder to find pack from last year. 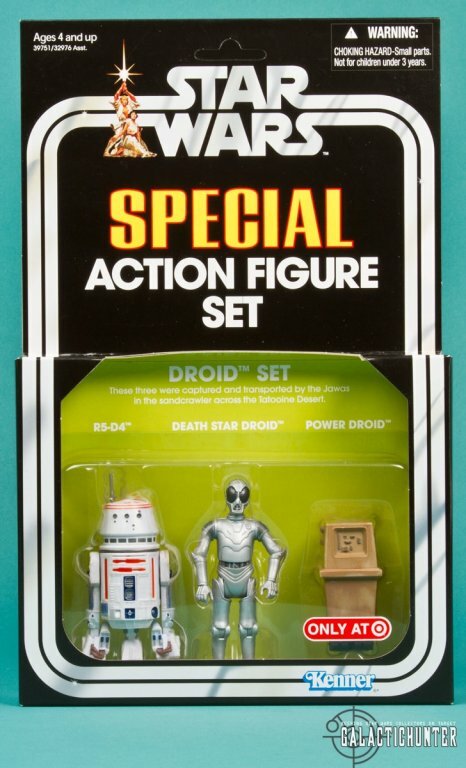 It's unclear whether Hasbro plans to re-issue this particular pack, but it's not included in the current case assortment. 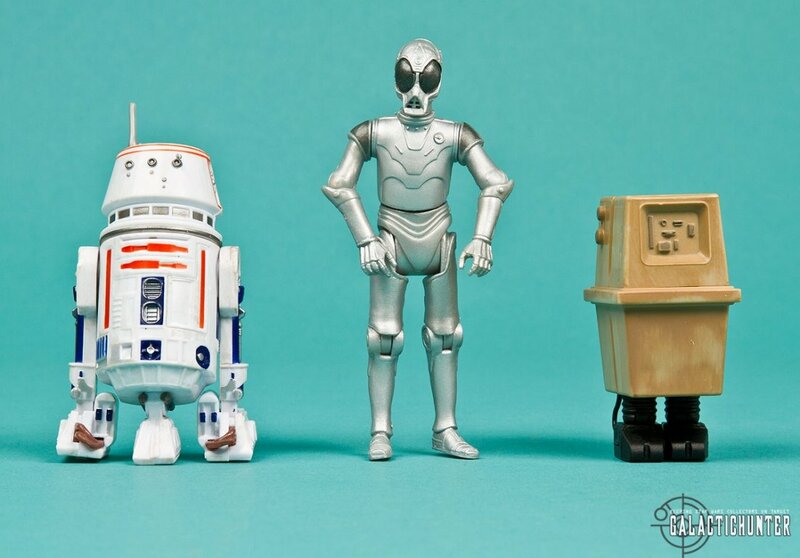 TOPPING THINGS OFF: We love our vintage packaging and our droids. This set amply refreshes on both levels. If you weren't able to collect the R5 or RA-7 droids from their previous releases, then here's your chance. The Power Droid is essential for that ANH sandcrawler scene, and while it would be a slight stretch to justify and valuate this figure individually carded, it enhances a great set that would look remarkable displayed, and because of this droid, the need to open up...GONK! * Our sample rang up for $14.99 and was reflecting the old DPCI number. The previous sets were priced for $19.99 and there is a possibility this could be an error. ** Update: Based on recent store reports, the actual retail price appears to be $24.99 with some reporting in at $26.99.